This article was originally published by the NATO Defense College (NDC) in September 2018. NATO Summits take stock of recent political and security developments, assess how they affect the Alliance’s posture and adaptation agenda, and decide on possible new directions. From the outside, a key feature of any Summit is also what it reveals about NATO’s political cohesion and relevance. The political cohesion of an international organization results from a general consensus among its key member states about its mandate, objectives and methods of operation. Relevance is about the extent to which an institution delivers on its mandate and therefore serves its purpose; relevance may be real or perceived, but is in any case essential to political cohesion. Cohesion and relevance can be undermined in at least three different ways. First, an institution’s cohesion and relevance are jeopardized whenever that institution proves unable to effectively deliver on the mandate it was established for. Second, cohesion and relevance are at stake when member states no longer agree on the objectives or methods of the institution, and as a consequence on the level of resources to allocate to it. Third, institutions’ cohesion and relevance may suffer from a lack of public buy-in for what they are and do. At all levels, the assessment results from a mix of rational analysis and a dose of manipulated subjectivity. All security organizations are faced with the challenge of staying relevant, as they find it difficult to adapt to a constantly evolving environment. One of NATO’s characteristics though is that its raison d’être stems from the need to address external threats – the Soviet Union during the Cold War, Russia or less well-defined challenges such as terrorism or cyber threats today. NATO’s cohesion and relevance have to be measured against the Alliance’s ability to tackle those external issues. 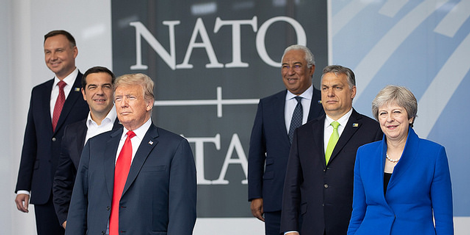 This said, what the July Summit – and indeed the last decade – has revealed, is that NATO is affected by a crisis that owes much to endogenous factors, specifically the way its own member states and citizens perceive the organization. As if, the real threat to NATO is as much about what is happening inside the Alliance as what goes on outside. Are Member States still on board? Consensus on the nature of threats to NATO’s member states is often still lacking. Russia’s posture, terrorism, hybrid and cyber warfare are assessed differently depending on the geographical location of the observer, and some member states hope that NATO could do more in response to their own security concerns. In this debate though, one must distinguish between the above-mentioned exogenous threats and the endogenous challenges, i.e. issues that have more to do with internal processes than with defence- or security-related external phenomena. While these internal challenges are not unrelated to external threats, they also have their own dynamics. The nature of transatlantic relations and the inherent burden-sharing debate provide one example of such internal issues. How much is the US committed to the Alliance? And how ready are European states to meet their commitment of spending two percent of their Gross Domestic Product on defence? On both fronts, recent developments indicate a shaky degree of commitment. Almost two years after President Trump put the burden-sharing issue back on the table in his inimitable style, at least three sets of conclusions can be drawn. First, while the US President’s tone is almost unanimously contested, and found to be simply counterproductive in some countries, it is also a fact that most European states have over time developed a strategic culture of defence under-spending, which today calls into question their ability to contribute to – if not ensure by themselves – their own defence. This is a problem for them, and arguably also for the military pact they belong to. The latest figures indicate an evolution towards more defence spending in most European states since 2015,1 yet trends can only produce an effect if sustained over time, and that cannot be guaranteed. Second, defence spending is only one part of the debate.2 Also at stake are the equally important aspects of capabilities and contributions to operations (the so-called “3 Cs”, standing for “cash”, “capability”, and “contribution”), as well as, one might add, better integrating capability development Europe-wide. Moreover, the resource allocation issue cannot be confined to NATO taken as its “sole beneficiary”. Both for the US and for most European states, NATO is just one framework of action among others, and defence spending can be targeted to a variety of activities or frameworks, national or European. Increasing defence spending is necessary, but it does not automatically mean that NATO or the transatlantic link will benefit. More specifically, the recent efforts observed in the European Union and the kind of resources that defence may attract may challenge the link existing between NATO and its member states’ defence spending policies. Third, the burden-sharing issue reflects a deeper debate on the meaning of transatlantic solidarity and the virtues of alliances. The transactional approach put forward by the US side overlooks one of the fundamental tenets of the Alliance i.e., the provision of defence guarantees by one member in return for political alignment by all others. The fact that such a system has benefitted all parties since 1949 is difficult to deny, and the deal can hardly be reduced to a financial equation. Furthermore, Alliance cohesion can only be undermined by a faltering commitment to Article 5 of the Washington Treaty, especially at a time when Russia is looking for ways to weaken the transatlantic bond. The US operational commitment to defence on the Eastern Flank is unquestioned, yet deterrence has much to do with the credibility of a given posture, which in turn is affected by the narrative developed at the highest political level. Is NATO still the most appropriate framework? A second set of issues has to do with NATO as an institutional framework for military operations. In response to Russia’s policy in Ukraine, the Alliance has designed and implemented a series of deterrence and defence measures that make it the premier defence organization on the Eastern Flank. NATO’s cohesion and relevance have arguably been reinforced as a result. In parallel though, the wide-ranging sphere of crisis management has been shaped by a series of developments that are indicative of NATO’s role in military operations. To start, the shift from crisis management to projecting stability reflects an evolution in the kind of activities that NATO is contemplating, towards capacity-building and away from large-scale military operations. Second, NATO’s relevance is challenged by a broad questioning of the merits of resorting to international organizations for military operations, especially when those operations imply coercion. Countries that happen to regularly resort to force have tended to be reluctant to do so through institutions. As a matter of fact, none of the current kinetic military operations — in Iraq, Syria, or the Sahel — is conducted through an international organization. There even seems to be a negative correlation between the level of use of force and the propensity to resort to international organizations as a framework. This is not to say that institutions are rejected in principle; the two NATO operations in Afghanistan and Libya provide examples of institution-led operations, but very few would now cite these two cases as models for potential future high-intensity operations. The latest institutional developments in this respect are also revealing. The European Union’s Permanent Structured Cooperation (PeSCo) is institutionalized but has in essence discarded the idea that it could become an instrument for the “most demanding missions” (EU’s Lisbon Treaty, art.42.6). In the same vein, the German-led Framework Nation Concept (FNC), adopted by NATO in 2014, brings together a number of NATO member states for defence cooperation. Although it now has a force generation dimension, the FNC is still largely about capability development, and furthermore originates from a country whose propensity to lead high-end operations is rather low. In contrast, the French European Intervention Initiative, established as a framework to enable a group of “able and willing” European countries to engage their military capabilities to “protect European security interests”3, was created outside any institutional framework. This does not mean that NATO or the EU cannot host operations deployed within the EI2 framework, but the flexibility inherent in the type of operations contemplated does speak against embedment into any institution. It follows that, partly as a result of past military operations in Afghanistan, Libya, or sub-Saharan Africa, the logic by which coercion must be embedded into an institutional framework is no longer a given, and is challenged by the countries for which coercion remains an important security policy method. This does not necessarily impact NATO’s collective defence policy, as cohesion in this domain is easier to bring about; but it does shape NATO’s “projecting stability” mandate, given that the scenarios in which NATO would conduct high-end military operations outside an Article 5 configuration are hard to identify today. And if “projecting stability” means that NATO is to become primarily a “training institution”, to what extent does this mandate reinforce NATO’s political cohesion and relevance? Are the people still committed to the Alliance? At the time when NATO was being challenged by an existential crisis following the collapse of the Soviet Union, one response was offered by the concept of “security community”. NATO would survive the end of the Cold War because it was more than a collective defence organization aimed at deterring the Soviet Union. It was also a community of states that shared values and a sense of “we-feeling”, which would henceforth shape its emerging cooperative security role, both in crisis management in the Balkans and in its enlargement scheme. A lot has happened since, and twenty years of operations in Afghanistan and Libya have made the “value narrative” more difficult to sustain, at least in terms of “value promotion” through intervention. This difficulty is partly expressed in the concept of “projecting stability” that implies a sense of retrenchment from past, more openly value-based policies. Yet, NATO wants to present itself as a value-based institution, along the lines of the Washington Treaty principles of democracy, individual liberty and the rule of law. This said, recent tensions over some member states’ illiberal practices and the spread of populist movements throughout the Alliance can only raise questions about the type of values that are shared and promoted by NATO member states. Is there a sense of “we-feeling” in the capitals of all 29 member states, so that the Alliance can still be characterized as a community of values? Is this the way the Alliance is perceived externally, in particular in the countries where NATO aspires to project stability? NATO is arguably less threatened by populist movements than the EU is,4 and the Cold War era (when some NATO member states had autocratic regimes) showed that it was possible to achieve some degree of consistency between democratic and non-democratic states. Some populist movements are even quite supportive of the transatlantic link and of the role NATO plays within it. In all these domains, anti-establishment politics may impact policy-making in NATO as a result of Russia’s infl uence on populist movements in the countries of the Alliance. This is where external and internal threats come together, and ultimately feed upon each other. The relevance and cohesion of any security institution is dependent upon its ability to deliver on the task for which it was established. NATO was established to defend its member states against external threats, and fighting these threats is what must guide its action. So far, those internal challenges have not tangibly impacted NATO’s ability to deliver on its main collective defence mandate. But if member states disagree on what NATO’s core task should be and on the resources to allocate to it; and if NATO citizens increasingly vote for parties that are not NATO-friendly, and ultimately bring illiberal leaders to power, what kind of cohesion can NATO draw on internally so that external threats are effectively addressed? There is no easy answer to these questions, yet two levels of response can be identified. One is institutional in nature, and requires NATO to demonstrate to the citizens of its member states its ability to effectively protect them, i.e. to show that external threats are tackled. The other level is national and relates to the effectiveness of liberal forces in fighting and winning the communication battle on the merits of multilateral and value-based responses to contemporary security threats. Since 2015, European Allies and Canada have consistently increased their defence spending, by almost 5% in 2017. In 2017, the majority of Allies also had plans to meet the 2% target by 2024. See, NATO Annual Report – 2017. K. Hicks et al., “Counting dollars or measuring value. Assessing NATO and partner burden sharing”, CSIS, Washington, DC, July 2018. “Letter of Intent concerning the development of the European Intervention Initiative (EI2)”, 25 June 2018. A 2017 Pew Research Center survey shows a relatively high level of adherence to NATO by member states citizens; see “NATO is seen favorably in many member countries”, Pew Research Center, Spring 2017 Survey, 9 July 2018. See S. Biscop, “The dangerous geopolitics of populism, and what NATO and the EU can do about it”, Security Policy Brief, No.97, Egmont, May 2018. Wallander, “NATO’s enemies within. How democratic decline could destroy the Alliance”, Foreign Affairs, Vol.97, No.4, July-August 2018. Thierry Tardy is the Head of Research Division at the NATO Defense College.